Take the cynical qualities of Indian Jones mix it with the movie Serenity and an eclectic gun-toting crew and you have the thrilling mix of Captain Frey and his oddball crew aboard the Ketty Jay. Set in a swashbuckling alien world where pirates have spaceships and the evil enemy are pretty darn similar to the flesh eating Reavers that the crew of Serenity faced, not to mention a female character Jez who is a dead ringer for psychic Summer Glau from Firefly and you could be mealy-mouthed about it all and say that this is a bit familiar and send a copy to Joss Whedon’s lawyer, but you’d be wrong, ‘The Black Lung’ is totally captivating. The mix of action, bloody killing, fierce monsters and mind-controlling Manes just never stop. These are not good people. The book begins with them stealing money from orphans and getting their asses whipped for their troubles, but at least the Captain's conscience is pricked by this escapade. The Awakeners (a religious group) are on one side, the Archduke and his mob the others. 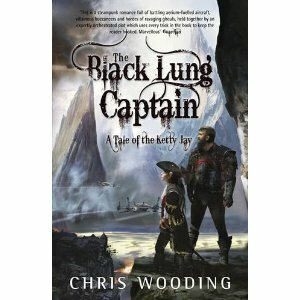 In between you have freebooters preying on whatever goes and if you ever feared that young fiction was too awash with vampires and mooning girls and there was nothing for boys to read anymore, look no further than Chris Wooding’s The Black Lung Captain. This is one very exciting ride replete with betrayals and counter betrayals and Slag the world’s most vicious cat to boot. Captain Frey worries at the outset that perhaps he’s a bit shallow and his life lacks meaning. After all being a pirate contributes little to humanity, but this is a story of a lost pirate finding a purpose. Ok, there’s still a lot of, killing, stealing and cheating to be done, but his heart is in the right place, even if the deal he is offered to find great treasure left by a lost civilisation by the mysterious Captain Grist is too good to be true. It will take them into a territory so fearsome no one save one man has ever gotten out alive. But Captain Frey and his crew will never turn down a challenge and they have Bess, an eight foot Golem on their side if all else fails. But watch out for evil ex-girlfriends. Women are usually Captain Frey's undoing. I never read Retribution Falls, which preceded this, but if it is half as good as Black Lung there is a treat in store for me. I have read an earlier work by Chris Wooding The Haunting of Alaizabel Cray and that too was a weird thrilling adventure in a wych infested foggy Victorian London – another great book for boys. If you ever felt there wasn’t enough adventure in your life buy this book and escape into deep space with Capt Frey, Jez the strange navigator, Silo the silent engineer, lovelorn Pinn and Harkins the fighter pilots, Crake, the deamonologist and the Doc, who, like in all good westerns is a drunk. c © Hackwriters 1999-2010 all rights reserved - all comments are the writers' own responsibility - no liability accepted by hackwriters.com or affiliates.